Catalog Home > Search > CYBER SPECIAL Tri-Fold Project Boards Carton Of 30 ~ 48 inches Wide x 36 inches High Corrugated ASSORTED Display Boards ~ Packed 30 / Carton ~ FREE FREIGHT on 2 cases !!! CYBER SPECIAL Tri-Fold Project Boards Carton Of 30 ~ 48 inches Wide x 36 inches High Corrugated ASSORTED Display Boards ~ Packed 30 / Carton ~ FREE FREIGHT on 2 cases !!! 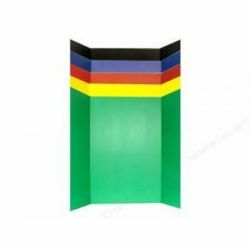 Display Board Tri-Fold Corrugated 36"x 48" ASSORTED Tri-Fold Display Board sets up and folds away quickly for safe travel and compact storage--ideal for business presentations, school projects, science fair projects and exhibits. Pre-scored foldout sides eliminate the need for props or easels. Durable corrugated construction. These boards are great for products such as glue, glue sticks, rubber cement, and paint pens, as well as other art related items. Corrugated 36"x 48" Assorted- Color include Red, Green, Blue, Yellow and Black. Must Be Ordered In Full Cases (Multiples Of 30 each) FREE FREIGHT WHEN YOU ORDER 2 OR MORE CASES Of WHITE OR ASSORTED DISPLAY BOARDS.